Motorcycle accidents are happening all the time with a growing frequency, which means that more must be done to save the lives of riders and prevent serious injuries. The problem is – motorcycles are much less stable and visible than cars, making it a bit easier for an accident to occur. In fact, for every mile that was traveled in 2014, the number of deaths occurring on motorcycles was over 27 times the number in cars. However, there are certain laws and regulations in many states that prevent these accidents or make them much less severe. For instance, 19 states and the District of Columbia mandate motorcycle helmet laws for all riders. Helmets have been found to be 37% effective in preventing overall motorcycle deaths. In 2014 alone, a total of 4,295 motorcyclists died in crashes. Back quite a few years ago in the 1980s, the total number of deaths on motorcycles was at its lowest low – however, this began to increase in 1998 and again in 2008. Motorcycle deaths account for 13% of all motor vehicle crashes, which means that we must look very carefully at why these accidents occur and what can be done. 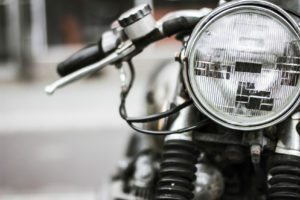 Many motorcycle accidents are caused by road hazards. There are many road hazards including rough roads, expansion joints, animals, and more to just name a few. We will be going over some of these hazards with the hopes that, in years to come, provisions will be invited to lessen the number of accidents stemming from these hazards. You can also find out about who may be held liable for your injuries in the event of a road hazard. Rough and bumpy roads can happen when a road is in disrepair. This can cause a motorcycle to lose control and crash. If someone on a motorcycle is engaging in cornering and comes across gravel on pavement, it may cause an accident. This can also happen if a motorcyclist is going too fast. Expansion joints connect two sections of a road together or a road to a bridge. An uneven surface may occur, which can cause a motorcycle rider to crash unexpectedly. If a motorcyclist were to hit a small animal, they could be thrown off balance. Swerving to hit an animal could cause a very serious accident as well. A slick surface made wet with leaves, crosswalk lines, and anti-freeze can cause a motorcyclist to crash. Slick surfaces can be especially dangerous when a biker is turning. If there is debris or objects in the road, such as tire treads or objects from a truck, they could cause an accident. The object could also hit and harm the rider. In the event of an accident, who can be held liable? In some cases, negligence can fall onto public entities like the state, county, city, or other public agency that maintains the roadways. If they knew about a hazard and did nothing about it, negligence may come into play. Prevention may be as simple as posting a warning. However, private individuals or businesses could be held liable as well. It really depends on the circumstances surrounding the case. This is why it is of utmost importance to have an attorney on your side to help you from start to finish. We understand the laws to help guide you through the very specific process of a personal injury. Call The RAWA Law Group today for more information! When Can I Sue Outside of Workers’ Compensation?